I admit that I can typically get caught up in a moment, but Harry Potter and the Cursed Child is my new favorite Harry Potter story. If you haven’t yet read it, I urge you to do so. Of course, it must be clarified that while this is in book format, it is not actually a book. It is the script to the play currently being performed in England and hopefully soon headed to a US theater near you. So, as one would expect, it reads like a play, not a novel. With that being said, though, I found the script format a breath of fresh air. I don’t need any more paragraphs devoted to the sorting hat or the train station – the script takes us right to the heart of the matter. That word–heart–is something this particular story has in droves. Is is nineteen years after The Deathly Hallows. Harry Potter is now an adult with children of his own. His youngest son, Albus, does not quite find his legacy endearing. Albus seems to be nothing like his father as he immediately befriends the son of Draco Malfoy and lands in the Slytherin House. Yet, Harry does not quite seem like himself either, for when it comes to Albus and he, Harry is less than heroic. This story became my new favorite Harry Potter tale because it shows us a deeply flawed, and relatable, Harry Potter. Just as his earliest readers are now adults, he struggles with the very same issues we do, especially as parents. Furthermore, the story is far more complex than I ever expected with relationships fraught in tension, difficult moments between children and parents, and even more potent experiences between friends than I imagined. Harry Potter’s world and family are far from perfect, and, frankly, I found such conflict vastly interesting and fun. In fact, the story itself is more ambitious than I believed it would be. Beyond the very realistic problems each character faces with friends and family, the story itself delves into time travel and alternate realities which allows for old favorites to reappear in logical, if not permanent, ways. Nothing unfolds the way you would assume in The Cursed Child. Harry is not the perfect father, nor is Albus the perfect son. Unlikely friendships are forged even as difficult sacrifices must be both accepted and allowed. 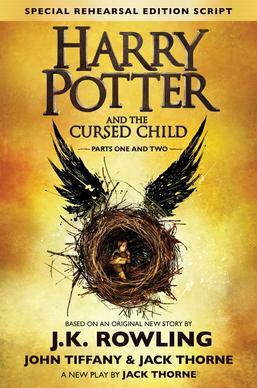 Harry Potter and the Cursed Child is a complex, mature tale firmly rooted in the realty of family life even as it breaks new ground in the realm of fantasy. It is funny, exciting, heart-breaking, adventurous, and emotionally authentic. I loved the script and I can’t wait to see the play. This entry was posted in Book Reviews and tagged arts, books, entertainment, fantasty, fiction, harry potter, harry potter and the cursed child, j.k. rowling, literature, reviews, scripts.